leads to an ECG machine that records the heartbeat. The ECG is a very useful and simple baseline test that can help to identify many different heart problems. patient will also be asked to keep a diary of any symptoms experienced so that the doctor can see whether the symptoms in question are connected to changes in heart rhythm. A 24 hour blood pressure monitor is designed to measure a patient’s blood pressure at regular intervals throughout the day and night, to allow the doctor to assess the overall levels of blood pressure. This is the best method of assessing both baseline blood pressure and the response to treatment. The blood pressure cuff is fitted to the arm and will inflate every 20 to 30 minutes during the day, and every hour at night. The device will beep when it is about to inflate, and when it does so the patient should keep their arm straight until it deflates again. The TOE is performed in much the same way as an endoscopy. The patient needs to fast for 6 hours prior to the test, an anaesthetic spray is used to numb the throat and a sedative is usually also given. The patient lies on their left hand side and the probe is advanced gently into the oesophagus as the patient swallows. It might feel slightly uncomfortable as the probe passes into the oesophagus, but the anaesthetic spray and sedative injection will help to minimise this. The procedure takes about 20-30 minutes, but because of the sedative the patient will be asked to remain in the department for one to two hours after the test. No fluids or food should be consumed until the local anaesthetic in the throat has worn off, which will again take one to two hours, and due to the sedative driving should be avoided until the following day; it is advisable that a relative or friend drives the patient home after the procedure. Developments in the speed and definition of CT machines now mean that pictures of the coronary arteries can be obtained non-invasively in most patients. In addition to providing information about the blood supply to the heart, a CT angiogram can also assess the pumping action of the heart and provide information about other structures surrounding the heart. 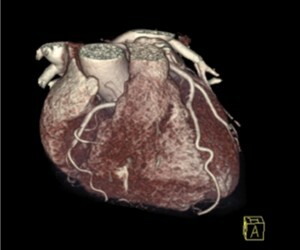 CT Coronary angiography is increasingly being used as a first step in the diagnosis of angina and chest pain. The patient should not eat for two hours prior to the scan and caffeine should be avoided for 12 hours beforehand, but drinking water is fine. A tablet or injection of a beta-blocker may be given to slow the heart rate adequately for the scan. Since the test entails the use of a radiographic dye (contrast) to outline the arteries, a recent blood test is needed to check the patient’s kidney function beforehand. A CT coronary angiogram is an outpatient procedure lasting approximately 45 minutes, and the patient can leave the department immediately after the scan and resume normal activities. An exercise tolerance test is an ECG carried out while the patient exercises on a treadmill. An exercise ECG is used in the diagnosis and follow-up of angina and coronary artery disease. It can also be used to assess some patients with heart muscle disease. The test usually takes about half an hour of which usually around 10 minutes is spent exercising. The test starts with walking at an easy rate and is gradually made harder by increasing the slope and speed of the treadmill. A doctor and a technician will monitor the ECG and blood pressure constantly, both during and for a few minutes after the test. The test can be stopped at any time if the patient develops any chest pain, breathlessness or fatigue. Comfortable clothing and shoes suitable for exercise should be brought along for the test. An echocardiogram is a test looking at the structure and function of the heart using ultrasound. A study takes about twenty minutes. It is painless and completely safe. A small handheld ultrasound probe is moved over the front of the chest wall to produce images of the beating heart. The structure of the various heart chambers and heart valves can be seen. The echocardiogram gives us a huge amount of information about the heart and is fundamental to the diagnosis and management of many heart conditions. Sometimes more detailed information about heart structure and function is needed than can be obtained from a standard echocardiogram. A transoesophageal echocardiogram (TOE) is an ultrasound scan of the heart whereby pictures are taken from the oesophagus (gullet) rather than from the front of the chest. investigation to guide us as to the best type of treatment for the patient such as medication, angioplasty or bypass surgery. Patients undergoing coronary angiography will be admitted to hospital as a day case and asked not to eat or drink for 6 hours prior to the procedure. The patient lies on a table in the cardiac catheter lab, which looks similar to an operating theatre but with an X-ray machine which moves around and takes the pictures. The doctor injects some local anaesthetic into the groin or wrist to numb the area. A small tube (catheter) is then inserted into the blood vessel and through this short tube different shaped catheters are passed to visualize the heart and the coronary arteries. Any procedure on the heart carries risks, which have to be balanced against the benefits. The most common side-effect is bruising and some discomfort at the site of catheter entry. This is generally mild and short-lived. Serious risks are very rare, approximately 1 in 1000. Complications include damage at the site of arterial access, bleeding, heart attack, impairment of kidney function (although this is rare in patients with normal kidney function), allergic reaction to the dye, stroke, emergency heart surgery and death. However, it is important to remember that the procedure will be carried out in a fully-equipped cardiac catheter lab, with a cardiology team (doctor, nurses, radiographer and cardiac technician) with all the equipment necessary should there be a problem. Cardiac Magnetic Resonance Scanning gives us the best and most accurate pictures of the heart muscle. Unlike conventional X-rays, CT scans and coronary angiograms, there is no radiation involved in the process; instead MRI uses a very powerful magnetic field to produce images of the heart. CMR can evaluate multiple aspects of the heart, including structure, function and blood supply to the heart. For the scan the patient must change into a gown and remove all jewellery and any magnetic items, including hearing aids; a screening questionnaire will be completed to check that there are no magnetic implants that would mean the scan could not take place. Most metal implants are MRI-compatible but there are contraindications, such as most pacemakers and implantable cardioverter-defibrillators (ICDs), cochlear implants and clips for aneurysms in the brain. All coronary stents and metal heart valve replacements are MRI-compatible; implantable loop recorders (ILRs) should have their data downloaded prior to the scan. not contain iodine, to which some people are allergic. gadolinium. If the blood supply to the heart is also being assessed an infusion of a drug, such as adenosine, will be administered. After the scan the patient is free to return to normal daily activities.